This book is about new and effective ways to address disease that aren’t commonly used by our physicians. 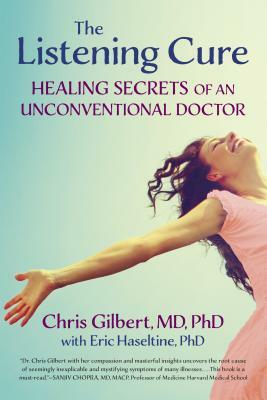 Dr. Chris Gilbert demonstrates that our bodies speak to us all the time. Through symptoms such as fatigue, joint pain, abdominal pain, anxiety, depression, and other symptoms, our bodies let us know that we have a problem and that we need to solve it. Dr. Gilbert, assisted by Dr. Haseltine, shows that by using her “giving the body a voice” technique, sufferers can discover what the symptoms mean and how to fix the often hidden reasons for their health problems.Each chapter reveals a different way of identifying underlying issues. These original, simple, and fun techniques include role-playing, inner group therapy, dream interpretation, art interpretation, nature walks, and even conversations with death. The Listening Cure covers a range of common afflictions, from obesity to back pain, and devotes a full chapter to resolving sexual problems in relationships.By listening to what our bodies have to say, Dr. Gilbert shows how to achieve long term deep cures versus temporary superficial fixes. Her secrets will become your secrets. Eric Haseltine is a neuroscientist with over thirty years experience applying advances in brain research to everyday problems. He has used his skills in fields as diverse as brain research, aerospace, entertainment, and national security. He holds a PhD in Physiological Psychology from Indiana University and completed postdoctoral training in Neuroanatomy at Vanderbilt Medical School. His current research focuses on mind-body interactions. He has written over one hundred articles on the brain for Discover magazine and Discovermagazine.com as well as sixty-five articles on applied neuroscience at PsychologyToday.com. Haseltine drew on his training as a brain scientist to author or coauthor twenty-one issued patents and twenty-three pending patents. In his 2010 book Long Fuse Big Bang, Dr. Haseltine showed how to apply principles of neuroscience to accelerating innovation. He served as the head of Research and Development at both The Walt Disney Company and The National Security Agency. In his last government post from 2005-2007, he was the Director of Science and Technology for the entire U.S. Intelligence community.